The Stanley Picker Gallery was originally established in 1997, with the generous support of the Stanley Picker Trust and the ambitious vision of Professor Bruce Russell, to provide Kingston University with its first purpose-built space for the creation and public presentation of contemporary arts practice. The Stanley Picker Trust takes its name from his founder, Stanley Picker: born in New York in 1913, of Russian-Jewish heritage, Stanley Picker arrived in England after studying at Harvard University to take over his father’s cosmetics business. The beauty brands developed by the company – among them Gala, Miners, Mary Quant and Outdoor Girl – each epitomised their era and created a wealth that permitted Stanley Picker to indulge his greatest love, the arts. Read more about Stanley Picker and the Trust history here. Celebrating its twentieth anniversary in 2017, over the years the Stanley Picker Gallery has built a reputation for a diverse programme of exhibitions and events that inspire and engage with the variety of creative practices researched and taught within the neighbouring Kingston School of Art. Forming part of Arts Council England’s National Portfolio since 2012, the Gallery aims to provide a source of inspiration for University staff, students and its wider constituent communities, from innovative collaborations with other arts organisations and research institutions, to nurturing the creativity of the very youngest of visitors through workshops and other events in partnership with local schools and community groups with our extensive Participation programme. 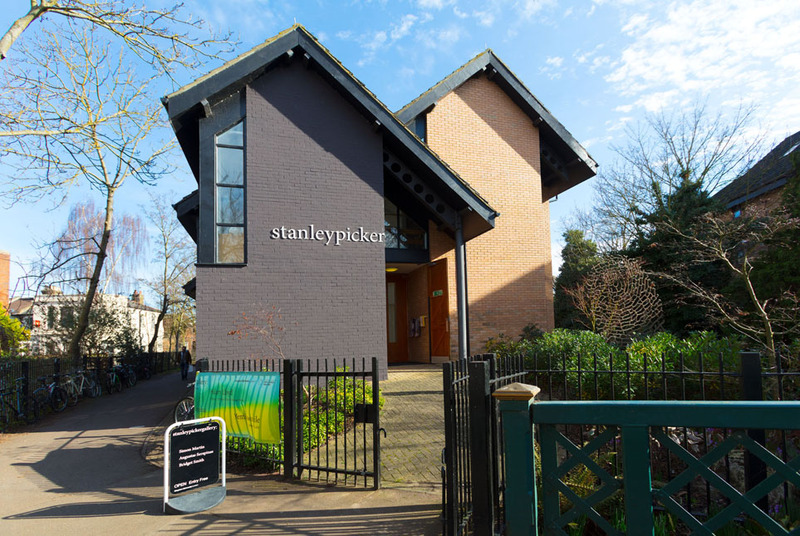 The Stanley Picker Gallery stages four exhibitions a year, as well as a broad programme of events, workshops, symposia, talks and salons. The Stanley Picker Fellowship programme sits at the heart of the Gallery’s activities. Supported by the Stanley Picker Trust since its inception in 1977, the annual scheme now provides an artist and a designer each with the opportunity to create and present a body of new work at the Stanley Picker Gallery as part of the research culture within the Faculty of Art, Design & Architecture. Over the last decade Fine Art Fellows have included Oreet Ashery, David Austen, Andy Holden, Laura Oldfield Ford, Elizabeth Price (Turner Prize Winner 2012) and Nicole Wermers (Turner Prize Nominee 2015). El Ultimo Grito were awarded the very first Design Fellowship in 2004, with subsequent design recipients including Boudicca, Fabien Cappello, Daniel Eatock, Shelley Fox, Onkar Kular, Julia Lohmann, Ab Rogers and Marloes ten Bhömer. Visit our Fellowships pages for details. The Gallery works regularly in partnership with the Royal Borough of Kingston and in 2007 initiated Muybridge in Kingston, an on-going research partnership with Kingston Museum to investigate and celebrate their world-class collection of Kingston-born, pioneering photographer and inventor Eadweard Muybridge. The Stanley Picker Gallery Collection consists of works on paper by artists and designers associated with the Gallery’s programme. The collection includes the very first Stanley Picker Fellow Jeremy Henderson (1977) and recipients from throughout the Fellowship’s history including Kate Davis (1986), Matthew Tickle (1989), Sadie Murdoch (1990), Uta Kogelsberger (1995) and Marta Marc (2000). The individual works in the collection have each been donated by their makers, testimony to the invaluable support provided by the Stanley Picker Trust to their on-going careers. In 2014 the Gallery launched Stanley Picker Gallery Editions, specially created to directly support our programme of activities and the artists and designers we work with. Artist Laura Oldfield Ford produced our very first Edition, a colour lithograph entitled Abiding by Rituals, and in 2015 designer Fabien Cappello created a limited edition key ring inspired by his Streetscape bike stand design. Please visit our Shop to view all new editions and publications for sale.